An event held by the Asia Society in Houston, U.S. Originally tobi workers (scafolding workers) used ladders in their jobs, which were very dangerous and didn’t allow any small acts of carelessness. So, tobi workers were required to have agility, carefulness and courage. The same qualities were also required of firefighters. 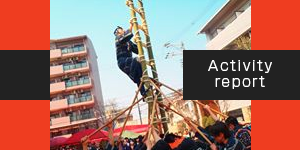 As such ladder-top stunts are said to be derived from the training of tobi workers, who were also firemen and had to acquire the techniques. Since “ladders” served as lookout towers to check the fire spot conditions and also as tools to save lives, the firefighters made blood-shedding efforts day after day to acquire and maintain ladder skills. 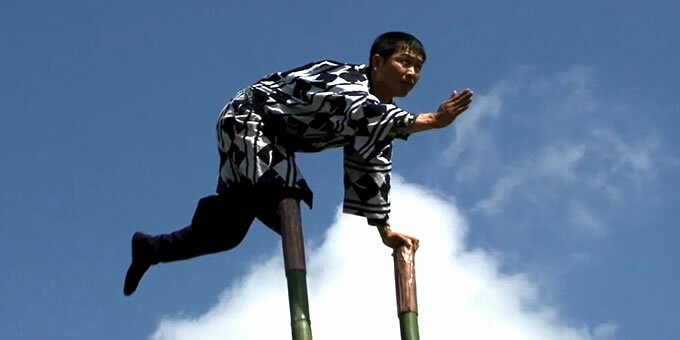 Ladders used for ladder-top stunts are 6.5 meters in length with 15 rungs each, and are made of new green bamboo. For a performer to maintain stability on such a ladder supported by 12 hooks, the skills and teamwork between the ladder-top performer and those supporting the ladder on the ground are extremely important and the key to showing excellent stunts is the close bond between them. Ladder-top stunts are categorized into the following 3 major types, which can further be broken down into 48 sub-types. Ladder-top stunts entertained ordinary people and even today these traditional techniques are enjoyed by people at New Year’s events. However, they are not a circus. It should be noted that the techniqes are obtained for the purposes of their occupations. 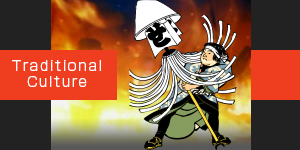 These traditional techniques, which derived from firemanship in the Edo era, were also designated as Tokyo Metropolitan Government-designated Intangible Folk Cultural Property (Performing art) on March 16, 2006. The EDO Firemanship Preservation Association assumes social responsibility to preserve this cultural asset and the mission of our society is also to preserve it in the Naniwa region. Copyright © 2015 Naniwa tobi Tradition Preservation Society All Right Reserved.